This girl sleeps! 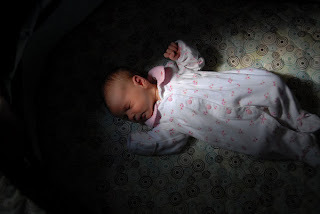 She is 5 days old, and she is sleeping 5 hour segments in the night. She takes after her daddy with mouth agape and nothing waking her. She slept right through booming fireworks with not so much a flinch - except she didn't like the Whistling Pete's. It's 10:00 a.m. right now, and she's been sleeping since 6:00 this morning with loud construction going on next door. We even took her to the doctor because she wasn't pooping, and we couldn't wake her for feedings yesterday. All is fine - she's just a sleeper! Got her to poop with a suppository too...poor thing! What a blessing to be getting so much sleep during this transition.